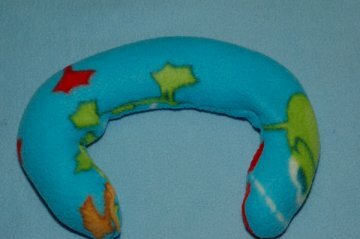 A neck pillow project and directions on how to sew one. 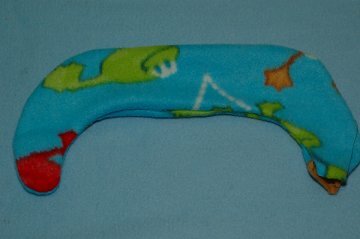 This pillow can be stuffed with batting or stuffing or you can stuff it with rice and use it as a heating pad. This is also a great project to practice round curves. 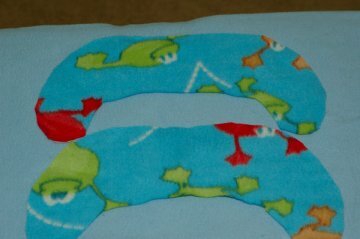 Cut out the shape and use as a pattern for the pillow. It will resemble a large C and will fit around the neck once it is finished. The pattern will be placed on the fold of the material. The fold is where the material has been folded in half. 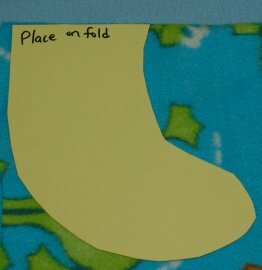 Place your pattern on the fold of your fabric and cut two pieces out of fleece material. 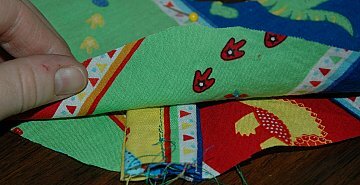 Place right sides together (add tab if desired between two pieces now) and stitch around the edges leaving a 2 inch hole for stuffing. Turn right side out and stuff with stuffing for a pillow or for a heating pad, stuff with plain white rice. Sew hole up securely by hand stitching. *For a heating pad warm up in the microwave for 1 minute or for a cold pack, keep in the freezer. 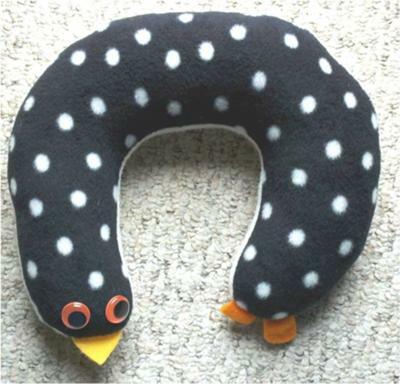 For fun you can turn this into a caterpillar or snake by adding felt pieces for eyes and a tongue. To add a tab, cut a piece of material 3x5 inches. Fold 1-2 inches of material toward the middle. Then overlap with top piece. Sew down the middle. Before sewing, insert tab folded in half between the right sides. Pin in place. Sew as directed above. This idea is perfect for a neck pillow that you can take along on an airplane. 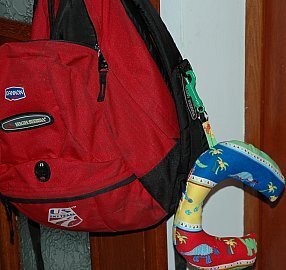 Add a keychain hook to your tab and attach to your backpack or carry on. See how one of our readers created a Penguin Pillow. Now try a heating pad pillow after this neck pillow.